A new survey from ChangeWave Research shows that a bigger iPhone 6 model would be a huge hit with buyers, revealing that even more early adopters in the U.S. would be interested in buying an iPhone this year than in previous years, Fortune reports. ChangeWave asked 4,109 people looking to buy a smartphone in the coming three months whether they would be likely to buy a new iPhone, described as a “next-generation iPhone 6″ with “a larger screen size, gesture control, a faster processor, an updated iOS operating system” and an $199 on-contract starting price. Of those asked, 14% said they were “very likely” to buy the iPhone described, while 26% said they were “somewhat likely” to get it. 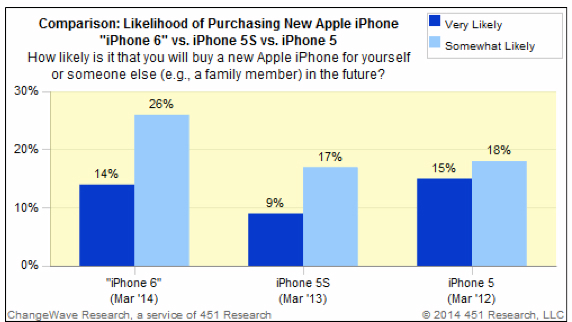 Both numbers are significantly higher than ChangeWave’s similar surveys performed in March 2013 and March 2012 for the iPhone 5s and iPhone 5, respectively. The study seems to further indicate that Apple will see increased sales from bigger iPhone models, something the company is also more than aware of. An internal Apple presentation submitted into evidence during the second patent lawsuit with Samsung revealed the iPhone maker realized long ago that consumers want what it currently doesn’t have, including a smartphone with a bigger display. Similarly, interest for the Galaxy S5 is bigger this year than in previous years, the same study has shown, although growth from last year isn’t as dramatic. 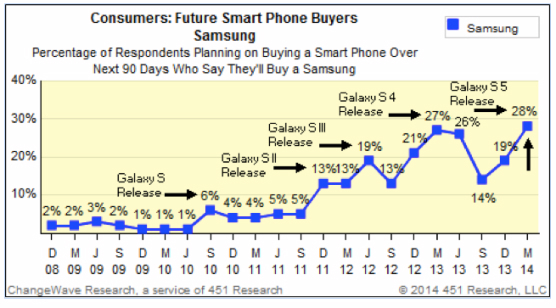 Charts from the study showing iPhone 6 and Galaxy S5 interest follow below.